The unfortunate consequence of living a long life is that seniors will deal with the loss of close friends, family or possibly their spouse. Bereavement is hard for all of us, but for seniors aged 65 or over, it can be even more severe. Studies show that the body’s immune defenses can be lowered in the period of grief after the death of a close loved one, but only if the bereaved is over 65 years old. The phenomenon of a senior dying soon after a spouse has been known for a long time. Harvard sociologists found in 2011 that men were 22 percent more likely to die shortly after the death of a spouse and women were 17 percent more likely. Until the recent study; however, there has not been a definitive reason for that happening. The recent study looked at people of a variety of ages who had lost their partner. It indicated that while bereaved spouses of all ages showed signs of grief and bereavement, only those over 65 showed a drop in immune function. People over 65 showed problems with a white blood cell called a neutrophil, which usually helps to fight off bacteria that causes infection. These people had similar numbers of these white blood cells, but the cells were not able to kill and eat bacteria as they usually are. Researchers believe this may be caused by a hormone imbalance and could explain why elderly spouses often pass away soon after each other. Depression can be another problem caused by widowhood, and it's important not to underestimate how long grief and depression can last. According to this study, one month after suffering a loss, around 40 percent of the bereaved show signs of clinical depression. After two months, about 24 percent are depressed, and after one year, 15 percent of the bereaved still show symptoms of depression. Even after two years since the loss, seven percent of people are still depressed. If your senior shows signs of depression, you’ll want to contact a medical professional immediately. As well as causing immune system deficiency and depression, studies blame widowhood for a variety of complaints ranging from weight loss to decreased physical activity, all of which can contribute to further physical decline. Caregiving can also be a factor in early death and poor health. Caregivers deal with additional stress and may be up to four times as likely to die prematurely than seniors who are not caregivers. The widowhood effect is worse for caregiving spouses than non-caregivers. American Medical Association studies have shown that caregiving spouses are 63 percent more likely to die soon after a spouse than those who are not caregivers. There are no quick fixes for bereavement. If a parent or loved one dies and leaves a spouse behind, a period of grief is inevitable, not only for the spouse but also for other family members. There is no immediate solution to mitigate the physical and mental effects of a grieving period; the most we can offer is our love and support. If your loved one loses a spouse, you will want to be around as much as you possibly can, but bear in mind that you are grieving too, especially if it was your parent who passed. Companion care from a professional caregiver could be a good option, which can help to keep your loved one going during these tough times. 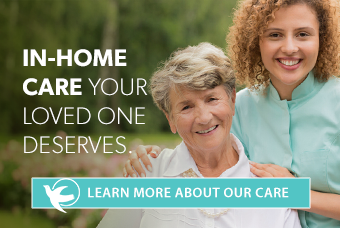 In companion care, a professional caregiver can visit your loved one as often as needed and spend time doing whatever your loved one needs. This person can chat and offer company and a sympathetic ear, she might play a game or help with a crossword or another of your loved one's hobbies, or she might provide help with light housework. Simply put, their addition to the home is something new, which can help your loved one think about something else. The professional caregiver can help with the other physical effects of grief as well, by preparing meals and making sure that your loved one is eating well and helping to get some moderate exercise. They can even help your loved one to get out of bed in the morning and take care of personal hygiene. Even the simplest of tasks can seem daunting while depressed. In addition, time spent with a caregiver awards you quality time away from the situation, and you need that. You know that while your loved one is with the professional caregiver, he or she is in great hands, so instead of worrying about your loved one you can take much needed time to process your own grief. If your parent is currently caring for a spouse fulltime, looking for respite care as early as possible could be best in the long run. While giving your loved one crucial space, it may also be minimizing the effects of the caregiving on his or her own health. Also, if the worst should happen and your loved one’s spouse passes away, the professional caregiver can be someone who has an existing relationship with your loved one, who can step in to help the whole family during what is commonly a turbulent time. For more information about respite care, read this article.